new year, go for it! 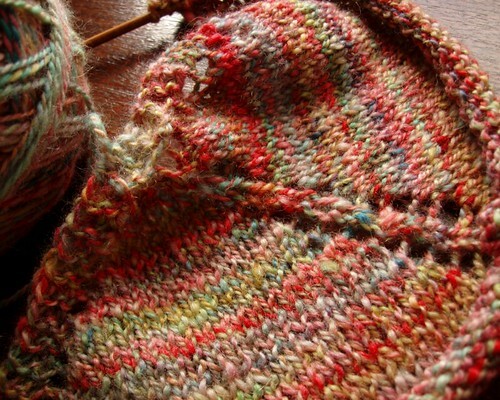 This new year, I’m starting off with knitting something I’ve never tried knitting before. As you are aware, I’m generally not a huge fan of light-weight yarns. I don’t spin them, I don’t buy them, and I don’t use them. But I’ve been trying to spin all ranges and that leaves me with some lighter weight yarns. One of those I spun this fall while I was at the Volant Pumpkin Festival. It is made from handdyed Bluefaced Leicester and named Kaleidoscope because of all the colors. Originally I intended to sell it, but my friend Johanna saw it and suggested I make something for myself. 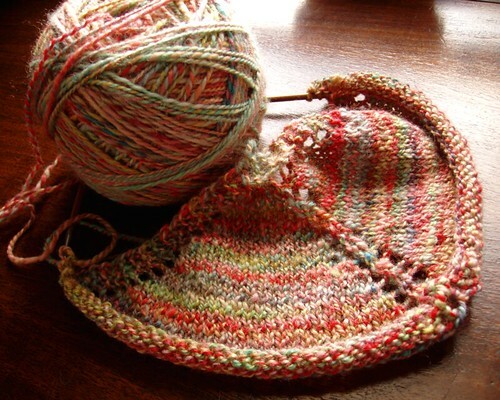 The yarn is DK weight and I have about 300 yards, so I wanted to knit something light and drapey with it. Plus, Cosy is always making lovely little shawls, and after seeing her work on one while wearing one, I just had to try it for myself. The hardest part was deciding on the pattern. I searched Ravelry and looked through my pattern books. Eventually I decided on Floe by Hannah Ingalls [rav link]. The most awkward part was starting, since I’d never tried anything like it before. In the instructions she has “mark center stitch” which confused me, so I put markers on either side of the center stitch. Unless that’s what she meant… Regardless, I’m happy with the progress and it’s growing quickly, although there is still a long way to go! Gorgeous yarn you’ve got there!